The Skid Plate protects your dog's chest, stomach, and side areas that are hardest hit when in the field! The Skid Plate is a commercial-grade chest protector that can help prevent injuries to your best friend and costly visits to the veterinarian. 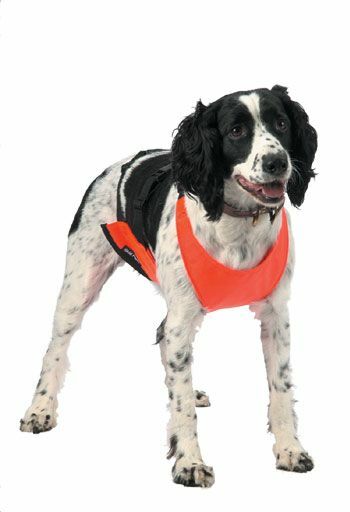 This dog vest is the ultimate in dog armor as it is contructed of a double layer of 1,000 denire Cordura nylon. The vest offers a fully adjustable strap system that allows the Skid Plate a virtual custom fit for your dog for maximum comfort. Tip: Use a flexible measuring tape. Measure loosely around the dog's waist and the deepest section of the dog's chest as indicated on the chart. Use these measurements to select to correct dog vest from the chart below. Small 2 1/2 " - 3 1/2" 20"-28" 17"-25" 25-45 lbs. Medium 3"-4" 23"-31" 20"-28" 45-65 lbs. Large 4"-5" 26"-34" 23"-31" 65-85 lbs. XL 5"-6" 29"-37" 26" -34" 85+ lbs.